Approximately two thirds of sheep are grazed on upland areas, but over grazing by sheep leads to environmental problems such as soil erosion. Selective breeding has altered natural breeding patterns allowing some sheep to lamb twice a year or produce twins or triplets. 15% of lambs which are born each year die from starvation, infectious diseases, predators or are stillborn or aborted. Orphaned lambs may be auctioned at markets at only a few days old and they are especially prone to disease and have a high mortality rate. Tail docking of lambs can occur without anaesthetic. Sheep may be transported long distances to slaughter, with some journeys lasting over 24 hours. Vehicles used to transport animals for eight hours or more must be licensed to ensure that they are equipped with drinking systems and temperature monitors. 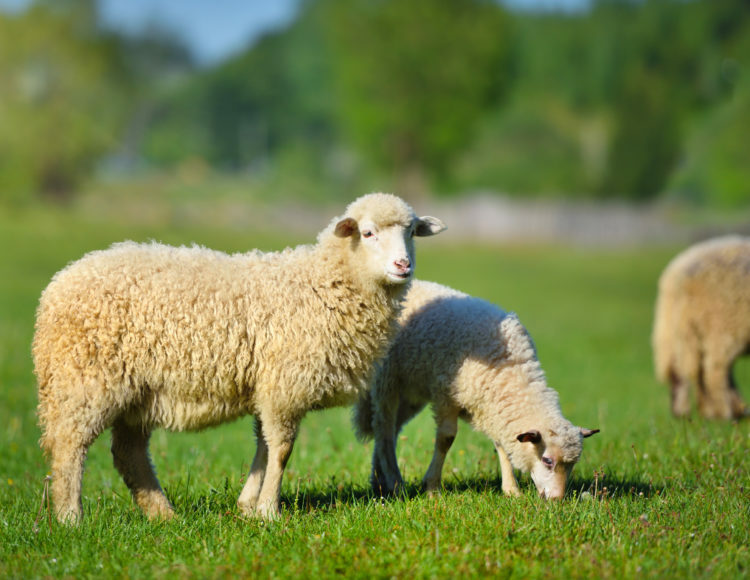 The average breeding life of a ewe is up to 15 years but the majority are slaughtered by the age of six years. Sheep are electrically stunned first, unless they are destined for religious slaughter. They are killed by having the blood vessels in their throat slit (sticking). Wool accounts for five to 10% of the total value of a ewe. Most British wool is used for coarse fabrics such as carpets, with over 65% of the clip used in carpet manufacture.